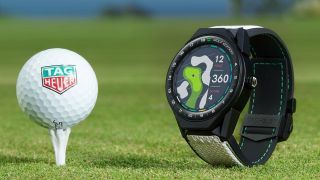 The Baselworld 2019 watch expo is underway, and one of the first smartwatch announcements from the show is the Tag Heuer Connected Modular 45 Golf Edition – a golf-focused version of the company’s Tag Heuer Connected Modular 45 Wear OS smartwatch. The Modular 45 Golf Edition differs from the standard model mostly in terms of the design, which here comes with a black ceramic bezel with the words ‘Golf Edition’ written along it. The bezel also has the numbers 1-18 around it, to indicate an 18-hole round of golf. The body of the watch uses black PVD titanium, while the strap is made from black and white rubber, and there are green accents on both the strap and the body of the watch. Basically, it’s a very golf-inspired look, and the company has also launched a ‘Tag Heuer Golf’ app to go alongside the watch. This lets you see maps of over 39,000 golf courses, see the distance to greens and hazards, measure shot distance, save scores and more. However, this app is compatible with other Tag Heuer Modular 45 watches and even with the Apple Watch, so it’s not an exclusive feature. The specs and features of the Tag Heuer Connected Modular 45 Golf Edition are much the same as those of the standard version, including a 1.39-inch 400 x 400 screen, GPS, NFC, a 410mAh battery, 512MB of RAM, 4GB of storage, and water resistance to 50 meters. And this isn’t a cheap device, coming in at $1,850 / £1,600 / AU$2,650. That makes it even more expensive than the already pricey standard Tag Heuer Connected Modular 45, which starts at $1,550 / £1,200 / AU$2,300, and which can get much more expensive depending on what materials you choose. If you want the Golf Edition it’s available now – and it comes with three Tag Heuer-branded golf balls.